Activity of mailing lists users - a mathematical approach. When George Kingsley Zipf, professor of linguistic at Harvard found in forties that frequency of words in English texts can be described in a very simple manner, by using a power law, no one did expect that the same or a similar mathematical dependence may be used to analyze a broad range of phenomena in nature and in social sciences. - internet stocks valuations, and many more. - the frequency of words searched on the Internet. APAP (Association of Polish-American Professionals) is the largest mailing list of Poles and everyone interested in Polish matters where discussions are in English and archives are placed at a server of Stony Brook University. During the time since January 1997 till June 2000, there were 28510 letters send to Poland-L and 25475 send to APAP discussion list. The number of postings of every author has been found. After that, these numbers were sorted by authors according to number of their postings. This is called sorting by rank, where rank simply enumerates authors. The frequency of postings is drawn as a function of certain power of rank (see the graph). Simply, it means that the data are described by a stretched-exponential function. 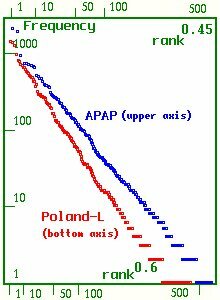 In particular, as shown on the graph, for APAP the exponent used has a value of 0.45, while for Poland-L a value of 0.6. It is difficult to say what is the mathematical meaning of these exponents since there is no good theory describing such a complex social system as a mailing list and there is no reasearch known on that. Nevertheless, one may find some interesting conclusions by looking closer to the results. 1. A very small number of participants of mailing lists posts a lot of letters, (3-5 of them post 10-20% of all messages!). 2. At the same time, a large part (30-50%) of participants is not active at all! These observations become very important when we realize that they describe well a broad range of social and economical phenomena. For instance, similar conclusions are valid also when we look to the number of visits to various web sites - very few of them are visited frequently (for instance, almost 50% of all searches are performed on Yahoo!). Also, it seems very likely that political activities of members of a democratic society would be described in a similar way: very few of them only have the political power and influence while the political role of majority is essentially passive and insignificant.